Plano is an exciting Texas city that many people are moving to. There are great employment opportunities and it is an excellent place to raise a family. 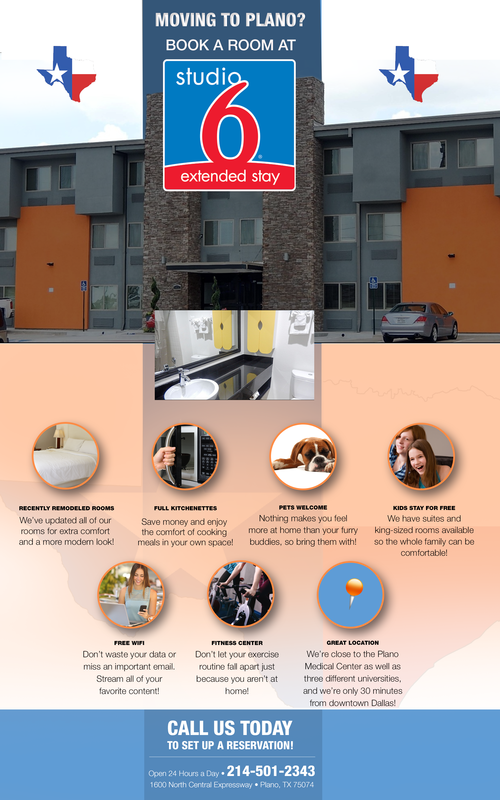 If you want to move here but you need to find a job or look for a place to live, don’t cram yourself into a regular hotel room when you can stay at the excellent Studio 6 extended-stay hotel! Our hotel was built specifically to make your life more comfortable. Instead of small, cramped rooms like you find in many other hotels, we give you the room to stretch out and relax. It will almost feel like you’re at home when you book a room with us, so contact us today and get a room for your extended trip to Plano. Read on to find out about a few of the reasons why staying with us is such a great idea! We’ve updated all of our rooms for extra comfort and a more modern look! We know how important it is to feel like you’re in a space that is well cared for, and one of the best ways for us to make that happen was to redesign the rooms to look and feel like a place we would love to stay in. Save money and enjoy the comfort of cooking meals in your own space! While trying out new restaurants can be exciting, after a while, it can start to wear you (and your wallet) down. Staying in some nights and making your favorite foods adds a wonderful extra layer of comfort to your stay. Nothing makes you feel more at home than your furry buddies, so bring them with! We can’t imagine being away from our pets for too long, so why should you have to be? There are plenty of places near Studio 6 to spend time outdoors with your animals, so neither of you feel cooped up! We have suites and king-sized rooms available so the whole family can be comfortable! Travelling can be stressful on everyone and by having separate rooms where your family can spend time alone can make a world of difference. Don’t waste your data or miss an important email. Stream all of your favorite content with our fast, free WiFi! Your exercise routine shouldn’t fall apart just because you aren’t at home. Use our fitness center to stay healthy! Call us today to set up a reservation! We would love for you to come stay with us at our newly remodeled extended stay motel!